This is the first station of the Way of the Cross by the Flemish expressionist painter Albert Servaes (1883-1966). He created it in 1919 for a church in the small village of Luithagen, Belgium, where it has continually received a great amount of attention. It is considered the pinnacle of Servaes’ work. One of the favoured themes of this deeply religious artist was the suffering of Christ, inspired by the gruesome events of World War I.
Servaes’ fourteen stations show the passion of Christ in all its rawness and inhumanity. 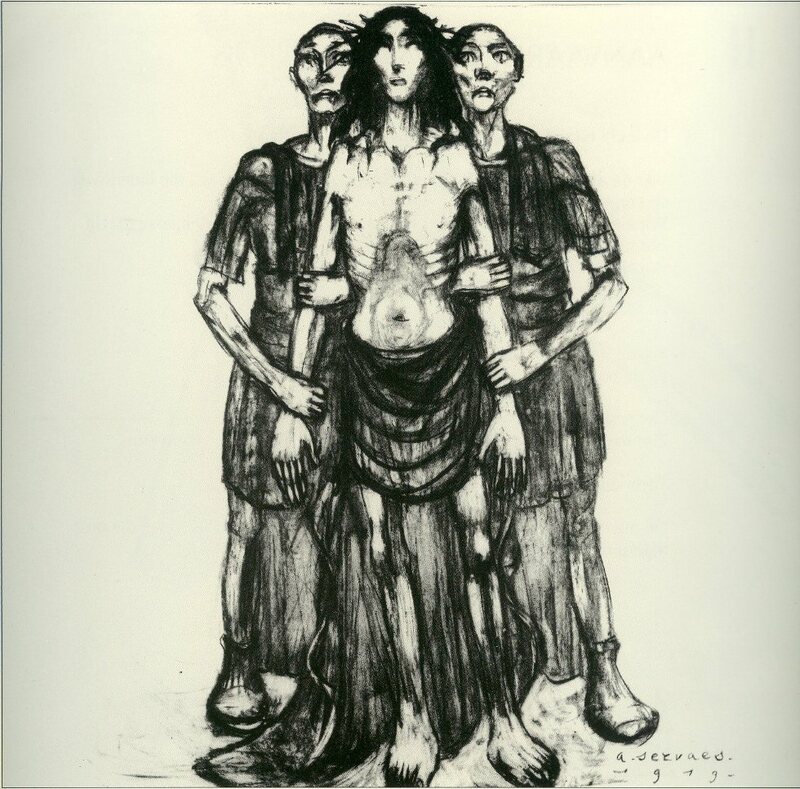 The dark charcoal drawings and the thick lines present Christ’s agony in a direct and unadorned manner. The realistic character of these stations contrasted sharply with the usual manner of rendition. Hence, soon after its placement, the work was condemned and by order of the Vatican removed from the church of Luithagen. It went from place to place and finally ended up in the Abbey of Koningshoeven near Tilburg in the south of the Netherlands in 1952. Traditionally the first station is portrayed as follows: Pilate is seated on a throne, while a servant is ordered to pour water over his hands to indicate that he is without blame as to Jesus’ condemnation. Jesus stands in front of him, surrounded by soldiers. But Servaes chose another approach. He only depicted three figures: Jesus and two soldiers. Jesus with loincloth and loose garments is positioned in the centre of the scene, his gaunt body drawn without elegant lines. Motionless he just stands there, a crown of thorns on his head. His hands are untied, but the two men fiercely clasp his arms and wrists. We witness a drama here. Pilate has found no guilt in Jesus, but has him crucified anyway. Servaes depicts the very moment of his astonishing choice between good and evil. This brings us directly to the essence and purpose of the Stations of the Cross: contemplation. The Stations invite the believing viewer to reflect on the mystery of the redemption of sinners through the guiltless suffering of God. In this extremely tension filled moment Jesus stands perfectly still in frontal position. The drawing does not show us the confrontation with Pilate, the soldiers or the Jewish crowd, but confronts ourselves with Jesus. He stands in the light and looks at us. The soldiers are in the dark. There is a strong resemblance between Jesus and the two soldiers, they all look emaciated. But this similarity is deceptive. There is a clear contrast between these three people, one of light and dark. The light on Jesus’ face and body portrays his glory and majesty. Even though Jesus is exhausted, dirty with blood and crowned with thorns, this cannot rob him of the radiance of his splendour. Jesus is the Redeemer! Albert Servaes: First Station of the Cross, 1919, charcoal on Japanese paper, 100 x 100 cm, Abbey of Koningshoeven, The Netherlands. Albert Servaes (1883-1966) was a Belgian expressionist painter. He was part of the first Latem school of painting which focused on mystical realism and became a founder of Belgian expressionism later in life. He became known for his religious works, typically showing the suffering of Christ, which stirred controversy in the Catholic Church. He also gained fame for his expressionist landscapes. Albert Servaes was born in the city of Ghent, in the Flanders region of Belgium. At the age of 23 Servaes joined a community of artists in Latem, just outside of Ghent. He developed an interest in religious works and mysticism, which would play a major part in the first LatemSchool. Other members of the school included George Minne, Gustave van de Woestijne, Valerius De Sardeleer and Albijn Van den Abeele. The school’s mystical realism orientation was a reaction to the Paris-based impressionist art that had dominated the painting world for the previous half-century. Servaes later experimented with painting techniques that founded Flemish expressionism. Because of his sympathies for Nazi cultural policy during the occupation of Belgium in World War II, Servaes fled to Switzerland in 1944 where he would remain until his death in 1966. Reina Folkerts has developed a special interest in the Stations of the Cross. She is attracted to them by their artistic merit as well as their spiritual meaning. She lectures about them and has built up a collection of stations of her own, which she exhibits on request. Her website is www.kruiswegstaties.nl.